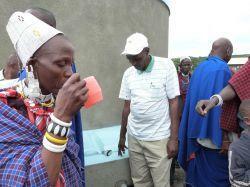 “The Water & Sanitation Project was completed ahead of schedule! The project began on January 14th and was initially scheduled for four weeks, but due to participation of the seven volunteers and the surrounding community, the village of Endulen is now enjoying clean and safe drinking water. This is the third time that Projects Abroad has partnered with the BridgIT Water Foundation to build a water system in remote areas of Tanzania. The first water project took place at St. Gabriel Primary School in the Kisongo near Arusha followed by Suma Engikaret School located 50km outside of Arusha. BrdigIT has also built water systems with Projects Abroad Jamaica and Bolivia. The most recent project took place in a remote Maasai village inside the Ngorongoro Conservation Area in Northern Tanzania, 3 hours west of Arusha. Previously the only water available to the community was a river which is shared with local wildlife and domestic animals such as cattle, goats, and donkeys. The commute to gather the water was long. The women and children are primarily responsible for collecting water, which can take two to four hours out of their day. 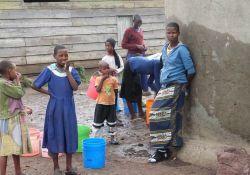 The Endulen School is home to about 800 pupils who need water for drinking, cooking and cleaning. The water system will reduce the amount of time the students spend collecting water as well as illnesses associated with drinking unclean water. The volunteers came from all over the world including the USA, Canada, France, Denmark and Australia. They spent their days digging and shoveling trenches, surveying the land and assisting with the pipe installation for the water pumping shed and elevated water tank. While in Endulen the volunteers lived with two Tanzanian priests at a Catholic Mission. They were treated to special trips to natural wonders such as the Serengeti National Park and Ngorongoro Crater, where they saw all the major wildlife as well as the Shifting Sands and mountain climbing, but the highlight for them was interacting with the local Maasai people. The official ceremony to turn on the water pump took place on February 6th. Many local people including several fathers from the Archdiocese of Arusha, a Member of Parliament, the Endulen Ward Councilor, the Village Leader, and school children gathered at the local church to deliver speeches and presentations. A few of the volunteers had already departed Tanzania, but the four remaining volunteers along with Wendy and Mark Tisdell of BridgIT were adorned with traditional Maasai shuka cloth and jewelry. The speakers gave thanks and appreciation for the hard work of the volunteers who made the project possible as well as supplying the funding to build the tank and pay the local engineers and plumbers. By the end of the ceremony, the leaders of the community proclaimed the volunteers to be honorary Maasai and extended residency and land ownership in the village. 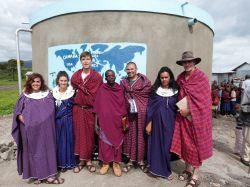 They also designated Wendy Tisdell as the First Lady of Endulen and made Mark Tisdell a Maasai Elder. The project will be sustained by a Water Project Committee that includes members of the community. Every family will contribute a monthly charge of 1,000 TSH that will be used for servicing the machines, fuel and minor repairs. The Ngorongoro Conservation Area Authority in collaboration with the Pastoral Council of Ngorongoro has also promised to continue assisting Endulen with the project.